Sculptures by Louise Bourgeois, buy and sell Spider sculptures. 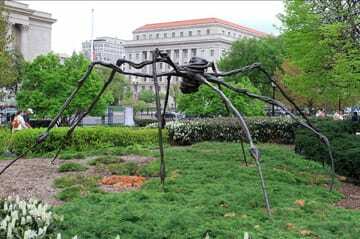 Spider is a sculpture by Louise Bourgeois. Louise Joséphine Bourgeois (French: [lwiz buʁʒwa]; 25 December 1911 – 31 May 2010), was a renowned French-American artist and sculptor, one of the most important artists in modern and contemporary art, and known for her spider structures which resulted in her being nicknamed the Spiderwoman. Her largest spider sculpture titledMaman has loomed over numerous locations around the world, standing at over 30 ft (9.27m). She is recognized today as the founder of confessional art. In the late 1990s, Bourgeois began using the spider as a central image in her art. Maman, which stands more than nine metres high, is a steel and marble sculpture from which an edition of six bronzes were subsequently cast. It first made an appearance as part of Bourgeois’ commission for The Unilever Series for Tate Modern’s Turbine Hall in 2000, and recently, the sculpture was installed at the Qatar National Convention Centre in Doha, Qatar. 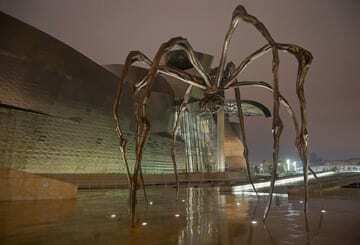 It is the largest Spider sculpture ever made by Bourgeois. The sculpture alludes to the strength of her mother, with metaphors of spinning, weaving, nurture and protection. Executed in 1996 as an edition of six and cast in 1997; bronze with a silver nitrate patina, with the first of the edition being steel. An example was acquired by the Denver Art Museum for its new addition in 2006. Other locations in permanent collections include the National Gallery of Art Sculpture Garden, Washington DC, and the Kemper Museum of Contemporary Art, Kansas City, Missouri. The steel Spider was exhibited at Musée d’art contemporain de Montréal from April to September, 1996. Various editions of this artwork have traveled extensively, including an example shown at the Hermitage Museum in 2001. In 2006, Bourgeois became the highest-paid living woman artist after a Spider sold for $4 million at Christie’s in London; which was surpassed in 2008, when anotherSpider sold for $4.5 million. A new record price for the artist was achieved when Spider number two acquired from Gallery Paule Anglim, San Francisco, was auctioned by a private collector with an estimate of $4 million to $6 million. The price realized at Christie’s on 8 November 2011 was $10,722,500. This is the highest price paid for an artwork by a woman artist at the time. Do you wish to buy or sell a Spider sculpture by Louise Bourgeois , please let me know, please use my email underneath or the contact form.